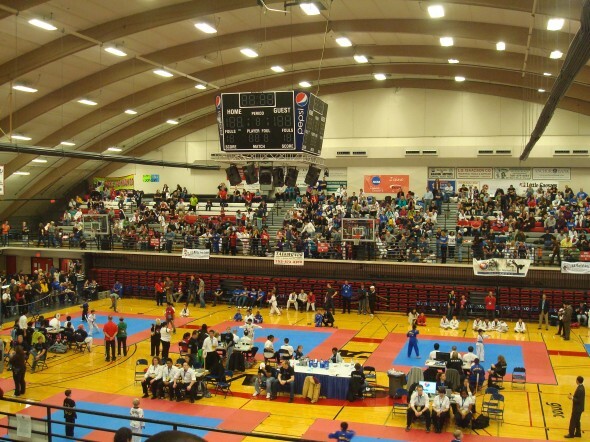 Orion competed in his very first Taekwondo tournament today - The WA State Governor's Cup. We had no idea what to expect since we had never been to a tournament before. I kind of envisioned Mr. Miyagi from the Karate Kid movie hanging out and one giant ring where people competed. Actually there were 6 stations set up for simultaneous competition. It was a bit mind-boggling at first. So much to watch at one time. It was held at St. Martin's pavilion which is basically a very large gymnasium at a local college here. We arrived at around 11:30 am but Orion didn't compete until about 4:00 pm. It was a long wait but it gave us time to absorb all that was happening and for Orion to settle his nerves. His first event was his competitive poomse. Poomse is Korean for form. It is basically much like a fluid dance of different Taekwondo positions. Orion had to do his purple belt poomse against 3 others at his belt level. At first he was tied for first place so they did a tie breaker round and unfortunately he didn't win that round. But still, he ended up getting the silver medal and we all were very happy with that. Shortly after that, his second event was the board breaking competition. 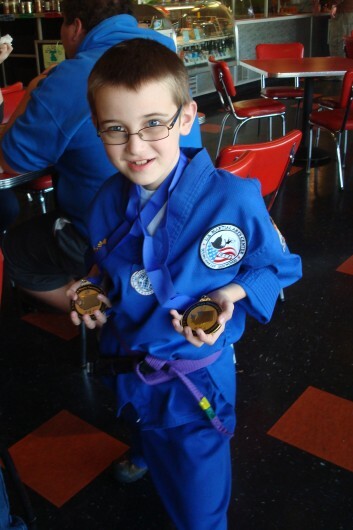 Again, he competed against 3 other students at his belt level. He did an awesome job. He was fast and strong and broke all of his boards on the first try. He ended up winning a gold medal for this event. The thing I am continually struck with about Orion is that you can never put limitations on him. Never. He just constantly amazes us with his tenacity and desire to learn and do his best. Orion, we are so proud of the young man full of integrity that you are now and are continuing to become. Keep up the good work! Way to go Orion!! We are so proud of you and your tenacity. With everything in life, keep pressing forward. You are an inspiration!